What is the best dog food for Doberman puppies? Which dog food for senior Dobermans? What is the best “wet dog food for Dobermans”? What is the best dry dog food for Dobermans? The Doberman Pinscher is a magnificent German dog breed – known for their tough appearance, their alert, and stubborn personality and for their unquestionable loyalty towards their owner. Dobermans are intelligent and need both mental and physical stimulation to reach their full potential, and it is important to feed a Doberman a high-quality diet with plenty of protein. Knowing what to feed a puppy, adult and senior may require some research, but while all Dobermans are individuals – there are a few basic things that every Doberman need. Learning what to look for in the search of a Doberman appropriate kibble or wet food is among the best things you can do for your dog since it will allow you to pick out a product that does more for your fur baby than to just keep him or her full and satisfied. Dobermans make wonderful family members, and we owe it to them to properly see to their nutritional needs. 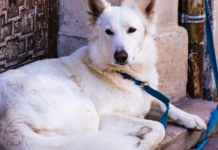 Related Review: Best Foods for German Shepherd Dogs. Dobermans are large and muscled dogs that need their daily nutrition to keep their bodies going. This All you need to do is to add water to the meal, and it will instantly turn into a delicious and meaty breakfast or dinner that your Doberman won’t be able to resist. 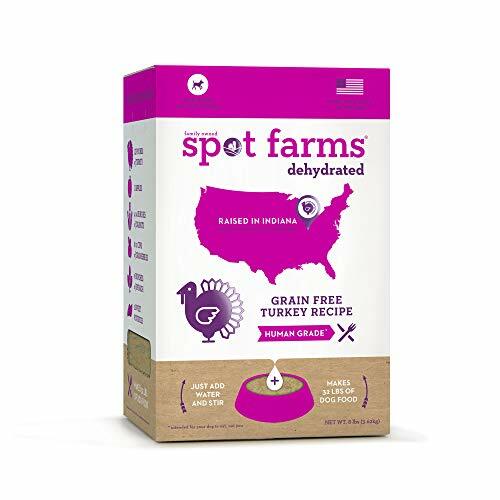 This high-protein dog food for Dobermans has real turkey, beef, chicken or fish (depending on what flavor variety you choose) as its first ingredient, it is human grade and made in factories that follow FDA standards. The dehydration helps preserve the nutrients at the time of processing, which means your dog gets to enjoy the benefits with every munch. Why We Like It – Freeze dried dog food might not be the obvious Doberman Pinscher diet choice, but that is likely due to few people knowing what it is. The process used to freeze-drying fresh ingredients locks in the nutrients in a unique way and preserves nutrients that can sometimes go lost when making kibble and dry food. Keep your Doberman fit and healthy with this lean meat Doberman dog food. It has chicken topping the ingredients’ list, followed by flaxseed, brown rice, apples, cranberries, and vegetables. 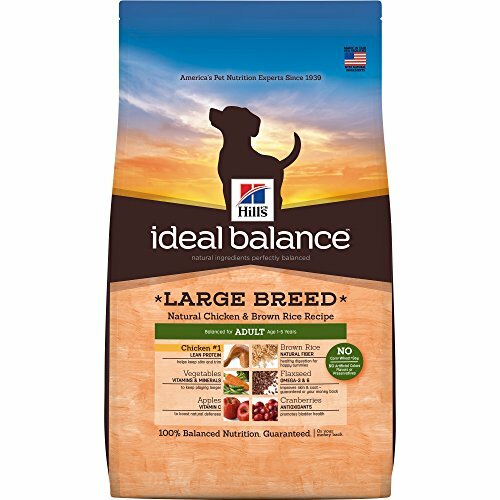 Hill’s Ideal Balance Adult Natural Dry Dog Food Large Breed Chicken & Brown Rice Recipe is a large breed formula that boosts the immune system, improves coat quality, has fiber for digestion and plenty of vitamins, minerals, and natural antioxidants. The best dog food for Dobermans will keep them at a healthy weight (a fat Doberman is not a healthy Doberman) while still providing enough energy and nutrients for them to thrive, and this product makes a great Doberman food thanks to its quality ingredients, added vitamins – all at an affordable price. Why We Like It – This product is accessible in both price and availability, without compromising in quality. If you are looking for the best dog food for Doberman Pinscher dogs, one that won’t force you to spend a week’s salary on each bag – this might be something for you. Here we have one of the top kibble brands in the world – known for making high-quality dog food with natural ingredients. It is hard to compete with this product as the best food for Doberman puppies since it has loads of healthy protein from real Bison and Venison; making it the kind of kibble that will help your big puppy develop both physically and mentally. 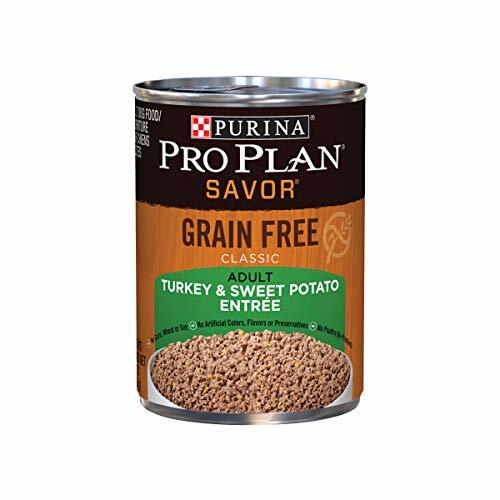 This type of protein is highly digestible, which is important for sensitive puppy stomachs, and it has a smoky flavor that will have your Doberman pup begging for more after each meal. The kibble size is small enough to be a perfect fit for tiny puppy teeth, and this kibble is packed with vitamins, minerals, and antioxidants from natural sources like fruit, vegetables, and legumes. For Dobermann puppies, food and nutrition are incredibly important, and the brands’ commitment to meeting the high standards of responsible dog owners worldwide show in their recipe. This flavor variety, High Prairie, is available for adult dogs as well. 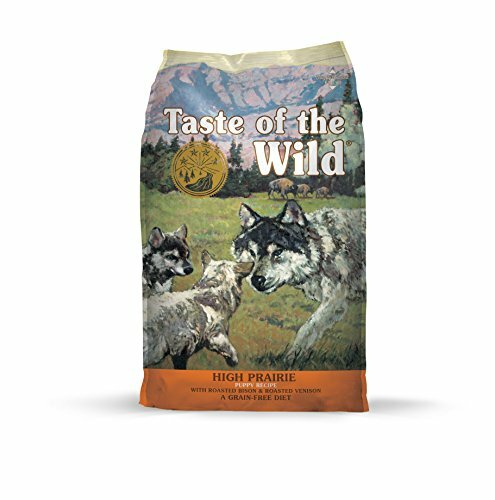 Why We Like It – This is the kind of kibble brand that has focused on developing a formula close to what a canine would eat if they lived in the wild, and it is packed with nutrition to help a puppy grow strong. It is the best dog food for Doberman puppies that love to play and run around since it will provide them with the energy needed to continue exploring the world around them. Some Dobermans can’t- or won’t eat kibble alone (due to being picky eaters or having teeth- or oral problems), and they might need a little extra encouragement. This wet food is a great Doberman Pinscher food to either give on its own or to use as a kibble topping for the fuzzy eater that won’t finish his- or her plate otherwise. This Doberman Pinscher dog food has no artificial flavor, color or preservatives, and it is also free from grain, wheat, corn, and soy. The company prides itself with ingredients that can all be traced back to trusted sources so that you know you are feeding your dog the kind of food that they deserve. Why We Like It – A Doberman diet needs to contain a high percentage of animal-based protein, which makes this product the best food for Doberman owners that want to give their fur babies a little something extra, besides kibble. 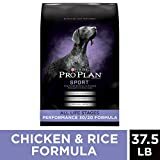 This recommended Doberman puppy food lists ingredients like deboned chicken, brown rice and salmon- and chicken meal, and its overall protein content is high. It is a large breed formula with added DHA (an Omega 3 fatty acid) for healthy eye-, brain- and bone development; which is just what Doberman puppies need to grow at a proper pace. The kibble size is adapted to large breed puppies, which is great for their teeth, and it is making it a product of interest for anyone on the hunt for the best food for Doberman puppy family members. There are no artificial preservatives, colors or flavors, and it lists quality meat sources rather than animal by-products. If you are unsure how much to feed a Doberman puppy – there is a practical Doberman puppy feeding schedule printed on the bag. Why We Like It – The best food for Doberman Pinscher puppies can be hard to find, but it is worth the effort since it sets the foundation for your dog’s overall adult health. 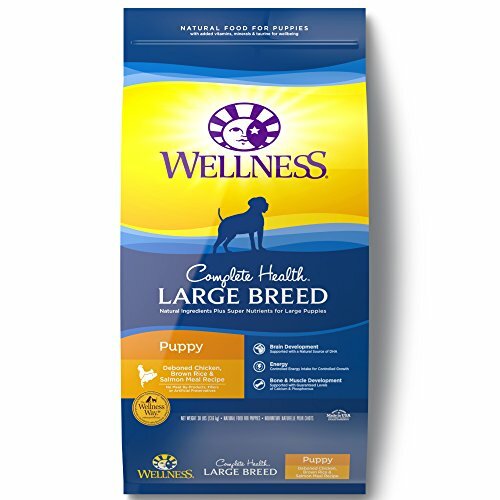 This is a product packed with nutrition to help a young pup reach his full potential, and you can find the correct Doberman puppy food amount listed on the product (in accordance with the puppy’s weight). 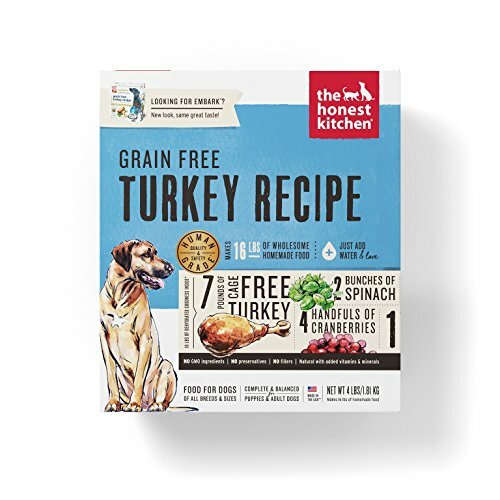 Spoil your Doberman with this grain-free turkey recipe, full of delicious deboned chicken, beef, duck, pork or turkey, depending on the flavor variety you choose to feed your dog. All the ingredients in this product are human grade; meaning they are fit for human consumption because dogs deserve to be brought up on high-quality food, just like we do. Perhaps you were looking for the best dry dog food for Doberman Pinschers, but this freeze-dried and dehydrated food might end up surprising you! It has a higher nutritional content due to the process with which it is made, and you only need to add water and stir for a minute or two to turn it into the most delicious meal your four-legged pal has ever had. Why We Like It – It is good to look past the well-known food brands; like Royal Canin Doberman food, from time to time, since it might lead you to a gem like this! The gentle dehydration process preserves as many nutrients as possible, and your dog will love the meaty flavor and consistency. You can even add warm water to turn it into a warm and irresistible luxury dinner! Keep an eye on your Doberman’s weight with this crunchy chicken flavored kibble! It is reported that over 70% of dogs that were put on this dry food lost weight within the first 10 weeks, something that makes it a great option for dog owners with Dobermans that can’t seem to stay at what would be considered a healthy weight. Chicken is a lean meat which provides them with the protein they need, while still promoting healthy weight loss and providing a path to keeping excess weight off in the future. There is vitamin C and vitamin E to boost the immune system, and flaxseed, oat fiber and coconut oil for a flawless coat and a soft skin. Keeping your dog – and especially a Doberman – at a healthy weight can significantly lengthen their lives and improve their life quality, and isn’t that what we all want for our furry babies? Why We Like It – What is the best dog food for Dobermans with weight problems? You are looking at it. This light blend will help your fur bestie down to what would be considered an ideal Doberman weight, which in turn will enable them to live longer and happier lives. As our dogs grow older, their nutritional needs change, and this is especially true for large-breed dogs like the Doberman and even a great dog food option for Great Danes. This kibble has added taurine which is known to promote cardiac health and a well-functioning heart, and it has added vitamin C and vitamin D to boost an aging immune system. Hill’s senior recipe is made with natural ingredients, plus amino acids, minerals and more, so that your adorable senior can continue to feel strong and on top of his game even as he ages. The real chicken provides the dog with plenty of protein, and the vegetable mix is a natural source of antioxidants and fiber to keep the metabolism working as it should. Why We Like It – Once a large dog hits the 7-year mark, it is time to start thinking of their changing dietary needs. 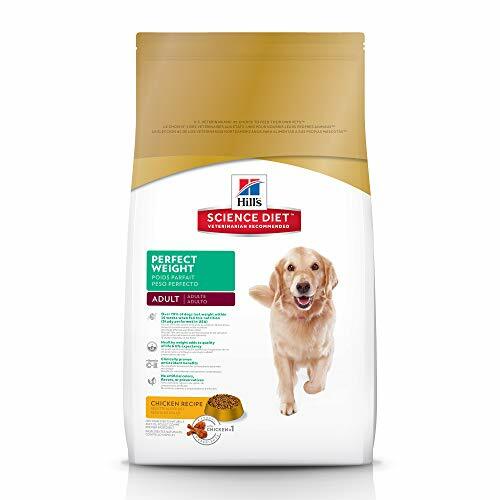 This product provides an older dog with nutrients that will help boost their immune system and keep their bodies strong so that you can get many more years together with your best friend. The correct senior Doberman food amount is specified on the kibble bag. Choose between Beef & Pees, and Turkey & Sweet Potato when purchasing this delicious wet food for hungry Dobermans! It is wheat, soy, and corn free, has no artificial flavors, colors or preservatives and it lists real meat as its first ingredient, which makes it a high-quality option for adult Dobermans that prefer wet food over dry food. It can be mixed in with kibble if needed, but it is also a complete and balanced dog food on its own. The food is made in carefully controlled Purina-owned factories in the United States, and it is ready to serve as soon as you open the can. A picky eater won’t be able to resist this delicious mix of meat, veggies and other nutrients, and you might be surprised by how quickly your Dobermans will finish their meal. Why We Like It – It is not hard to see why Dobermans love this meaty and soft recipe! It has a good mix of protein, fiber, vitamins, and minerals, which can either make a great compliment to your Dob’s kibble diet or a complete diet all on its own. 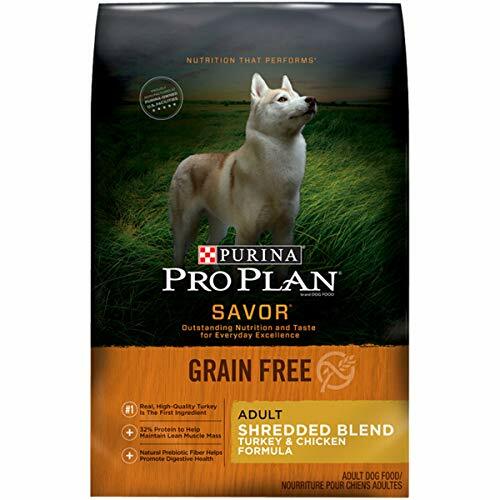 These shredded blend dog food formulas come in three different flavors (Turkey/Chicken, Beef/Salmon, and Turkey/Duck/Quail) because Purina knows that not all dogs like the same meat types, and since some dogs may suffer from food allergies. Doberman Pinschers are prone to some food-related allergies, which makes this kibble a good option since you can choose not to include the protein source that your dog might be sensitive to. This is a grain-free hypoallergenic product with vitamins and minerals, it contains 32% protein that promotes lean and strong muscle and there is natural prebiotic fiber for digestion and the immune system. Why We Like It – This dry food is similar to many pricier dog food brands, and it has a good amount of protein from quality meat sources, that suits a Doberman’s energy needs. Dobermans are large and strong dogs that need a high-quality diet throughout all life stages. Just like many dog breeds; Dobermans are prone to some health conditions, but many of these can be prevented and/or helped by providing the proper nutrients. The sooner you start feeding quality food the better, but it is never too late to start! Learn what you need to look for, where to find it, and start browsing the internet for the product that would be the best fit for you and your dog! Switching from a low-quality food brand and to one that full-fills your Doberman’s nutritional needs has the potential of making a difference that your dog can feel on the inside, and something you can see reflected on the outside. 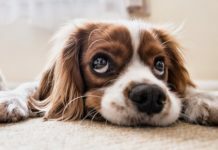 Our dogs deserve the absolute best, so let’s have a look at what we need to consider when shopping for the right kibble, wet food or freeze-dried product. When you are buying dog food, no matter what dog breed you are buying it for, it is important to be aware that not all meat ingredients are high-quality meat ingredients. Many cheap dog food brands will list ingredients such as “animal by-products,” “chicken by-products” and “meat” (without specifying what meat it is), and these are considered low-quality meat ingredients. By-products is what is deemed unfit for human consumption at slaughter-houses and may or may not contain enough protein and nutrients for your dog to thrive. Unnamed meat sources are also questionable since a dog food brand that is proud of their food content would specify where the meat comes from, so the fact that someone chooses not to potentially says a lot about quality. Instead of above-listed meat ingredients – look for real and specified meats; such as deboned chicken, salmon, beef and pork, and make sure that these meat products are listed as high up on the ingredients’ list as possible. Meat meals, for example, chicken meal, are also considered good protein sources in dog food. This is a little Easter egg you should be happy to find in your Doberman’s diet, since recent studies show that it might be essential for a healthy and strong heart. Do not rule out products that do not list Taurine, however, since some other ingredients might contain taurine naturally. If you are unsure whether the product you are interested in contains the recommended levels of Taurine, then you can always reach out to the manufacturing company and ask, just to be sure. 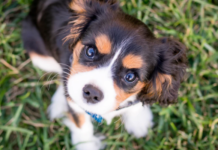 It is incredibly important to follow the feeding guidelines provided on the product you choose to feed your dog with since this will prevent him or her from gaining excess weight. Due to the body shape of the Doberman, it is both inconvenient and harmful for the dog to be overweight since their bodies are not built to carry the extra kilos. Staying at a healthy weight will allow your pup to live longer, as well as improve their overall quality of life. 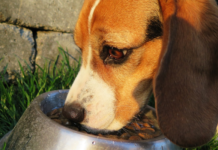 All quality dog foods provide feeding guides based on the dog’s weight. The best and most recommended puppy food for a Doberman is the ‘Taste of the Wild High Prairie PUPPY (Venison & Bison)’. The quality ingredients and high protein content form a mix that has been carefully calculated to help your Doberman puppy grow at a healthy rate and develop a strong immune system and a problem-free digestion. 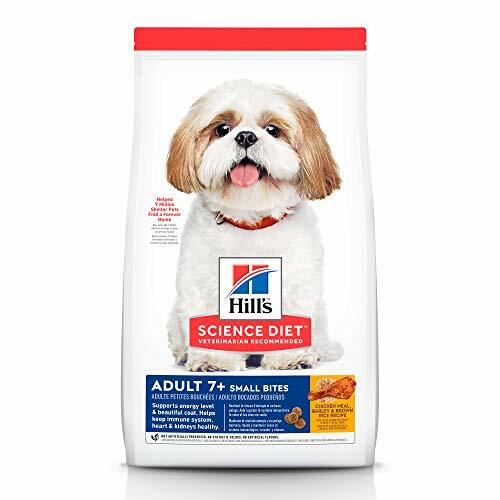 ‘Hill’s Science Diet Senior Dog Food, Adult 7+ Active Longevity’ is a kibble for dogs over the age of 7, and it carefully sees to their changing nutritional needs to that they can keep feeling young and strong, even though the years pass by. You can also try Orijen senior dog food. 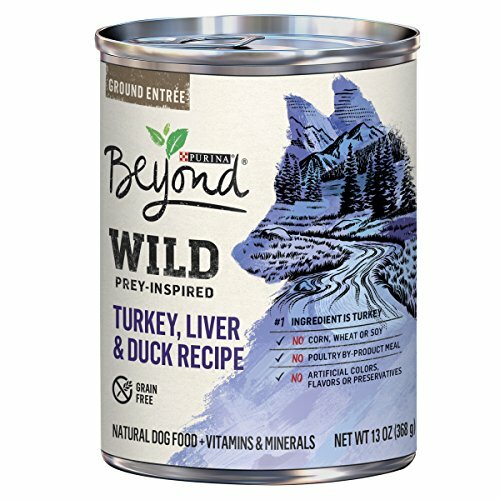 The ‘Purina Beyond WILD Grain Free Natural High Protein’ has a blend of ingredients which can all be traced back to quality sources, and it can be eaten on its own as a balanced meal or mixed in with dry food to make the kibble more appealing. As individual as this may be, a strong contender is the ‘The Honest Kitchen Human Grade Dehydrated Grain-Free Dog Food’. It is dehydrated to better preserve nutrients, which means it is lightweight and takes up very little space, and once mixed with water it transforms into a delicious, nutritious and irresistible meaty meal for your best fur friend! 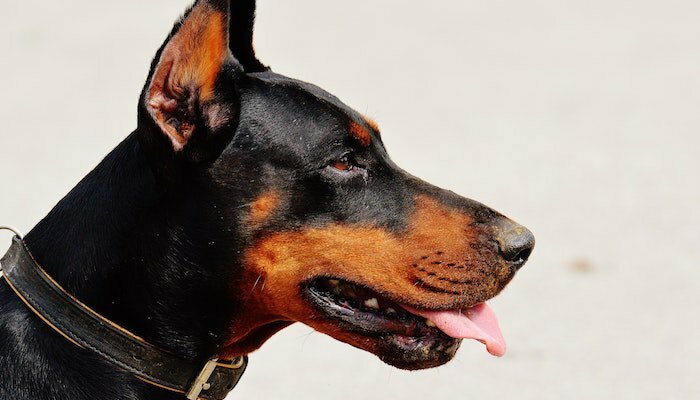 The Doberman is loyal to his family and to his owner, so try and return that favor by providing quality nutrition throughout all his life stages. 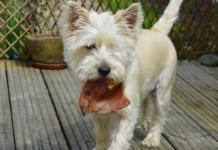 Remember that nutritional needs change and that your dog will require different food products depending on their age. It is not hard to learn what ingredients to look for and what to avoid when shopping for food for your Doberman, and once you have figured that part out, it is just a question of finding a product that your pup approves of. You might have to test out a few different ones before you get it right, but you can always check to see if you can find small sampler bags first before taking the step and purchasing a larger quantity bag. The internet is a great place to buy dog food, since you can compare prices, check reviews and get access to hundreds of products, but also because you get it delivered to your door, which, trust us, your back will thank you for. Don’t let a fancy looking bag full of printed promises fool you into thinking that it has high-quality ingredients. Always read the ingredient list and make an educated decision based on that, rather than to trust the oldest marketing tricks in the book. Dobermans are known for their superior intelligence, they originate from Germany and the breed first started to take form somewhere around the early 1880s. 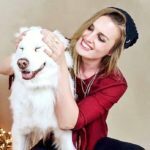 Next articleCBD Oil for Dogs With Cancer – Can CBD Really Help?